We’re in the home stretch, folks! It’s Week 5 of the One Room Challenge so you know what that means? I better shift my behind into fifth gear! 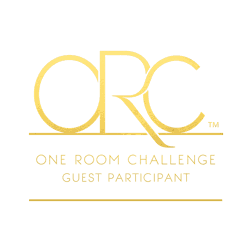 What’s the One Room Challenge you ask? It’s a 6 week challenge hosted by Linda of Calling it Home where designers & bloggers attempt to makeover a room. 6 Weeks might seem like a long time but trust me, it’s not! If this is your first time visiting – WELCOME! You’ll probably want to check out Week 1 (the design), Week 2 (demo), Week 3 (tile) and Week 4 (plank wall) and then come back here! This week was all about installing trim, window casing and getting the plumbing connected. If you’ve been following along on Instagram you might have caught all the drama about my vanity. Last week I mentioned that I was worried that the plumbing would not work as it hit the vanity right at the bottom of the cabinet. And indeed, the plumber initially said we would have to either move the plumbing up or down in order to make it work. I had already installed plank walls so I was adamant no plumbing was getting moved. I searched and searched and searched and could not find another nice/affordable vanity that would fit into our space. It needed to be only 17 inches deep because of the baseboard heating inside the door and most vanities are 18+. UGH! The plumber figured out a way to kind of tunnel through the side of the vanity and make it work. Yes, there’s holes inside the cabinet. Do I care? No! 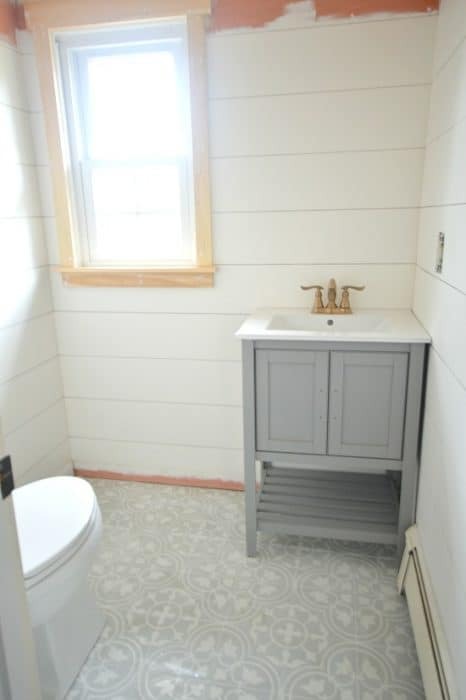 It’s a powder room and the unit is still perfectly functional! Apparently we also should have had the flange on our toilet replaced BEFORE we installed the tile. Luckily, that all worked out too but I was certainly very worried for a moment in time. The window trim was by far the easiest project we tackled this week. I decided a craftsman style would fit the room better than the standard mitered angled. My thought being that the straight angles would complement the plank walls nicely. If you want to achieve the same look yourself, I’ve labeled the size of wood we used in the picture below. You will of course want to measure the length of each piece according to the dimensions of your window. 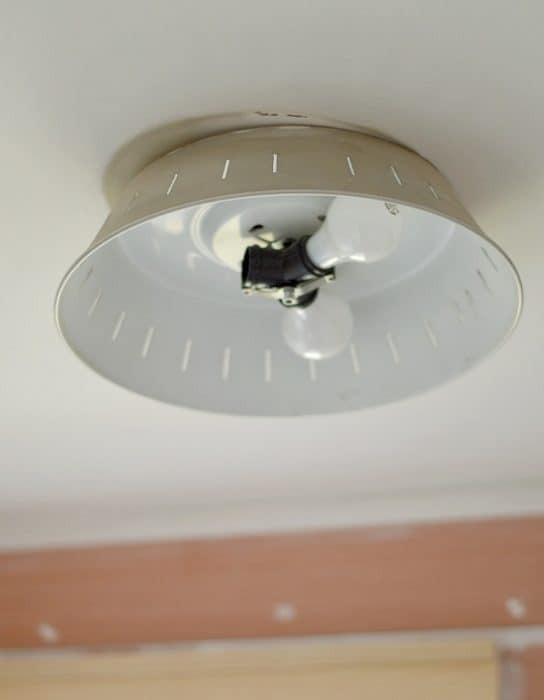 I’m not sure I ever shared the “UFO-like” light fixture that we currently have. Needless to say, that’s on the list, too! I’m so excited to be done and to share our powder room reveal next week! Make sure you are following along on Instagram for sneak peaks and subscribe to email updates below to get the big reveal direct to your inbox! I am so happy to find some photos of this vanity! I have had my eye on it online, but was hesitant without being able to see it. I have seen a few other reviews complaining about the height of the cabinet part and difficulty working with existing plumbing. Would you happen to know how many inches off the floor the shelf of the cabinet is or where your plumbing line hits at? Thanks you so much!!! Hi Jessica! So we did have issues with our plumbing mainly because our plumbing comes through the side and not the back. That being said, we had to cut a piece out of the shelf in order for the plumbing to be able to drop down enough. I’m sure this will probably be the case with most plumbing situations. Now, because it’s in our powder room we didn’t need the shelf (although there is some storage still in there). If you need the full shelf of storage I would think twice about purchasing it. If you don’t need it, then it’s a really beautiful (and solid) piece for the price! Unfortunately, my toddler has hidden the tape measure and I can’t for the life of me find it, so I can’t measure the height for you. BUT I’m pretty sure you would have the same issues that I’ve had. I hope that helps! So much inspiration here! Thanks for sharing your progress. 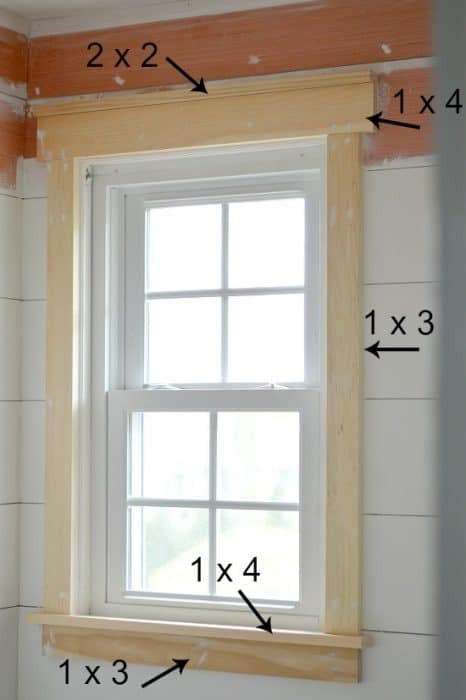 Question on your window trim — is the 1 x 3 trim actually 1″ x 3″ or does it follow the maddening lumber measurements of actually being like 2.5″ x .75″? I went trim shopping yesterday to try & emulate your craftsman look, and couldn’t find any trim that’s actually 1″ thick. Hi Holly – yes it’s in fact 2.5 x .75! The label where the price is should read 1 x 3(common) and have the actual real dimensions too. I still don’t understand why they do that!! Hi! All the sources are at the bottom of the “Reveal” post! Yay, a solution. I bet that put a smile on your face. I’m adoring how this room is turning out so far! All the details in this space are amazing! From the tile, to the walls, to the window trim…this space is perfection. Can’t wait to see your final reveal! I’m so relieved to hear that your vanity worked out! It’s just beautiful and it looks perfect with the floor. I can’t wait to see your reveal next week! 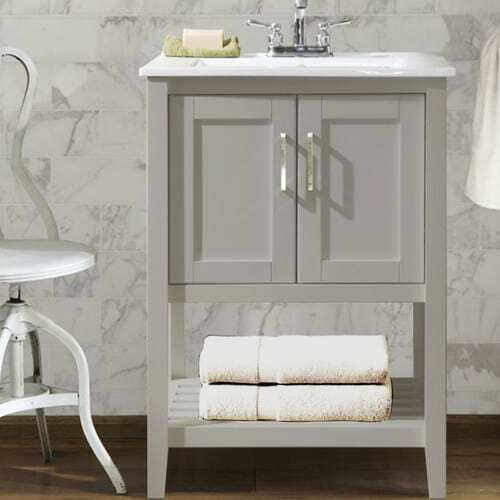 I am loving the look of the tile and plank walls with the vanity. So pretty together! We have craftsman trim in our home and love it. It does look so good with your plank walls! I can’t wait to see the final reveal! Trim makes all the difference. This is going to be amazing all painted out. Looks awesome already!! 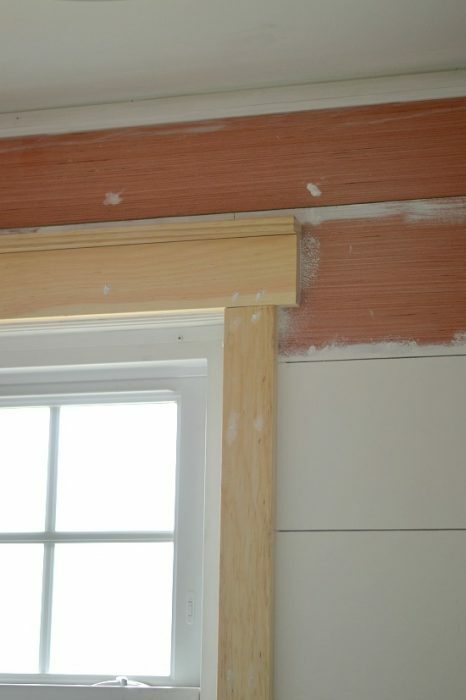 I agree with the trim, it looks much better that way then being angled! Laura, I’m so happy the plumbing worked out, too!! So happy your Plummer problem solved! Your powder room looks awesome – I can see it all coming together!! So excited for you!